We’d love your help. 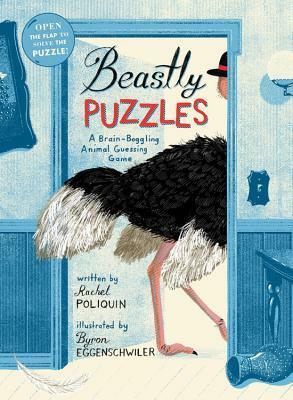 Let us know what’s wrong with this preview of Beastly Puzzles by Rachel Poliquin. This book asks children: If you're given a list of features and characteristics, can you guess which animal they make? This might seem easy enough. But solving the puzzles in this book is deviously, outrageously, almost impossibly tricky! Though the thirteen animals included are easily recognizable --- such as polar bear, snail, ostrich, pufferfish --- the clues are unexpe This book asks children: If you're given a list of features and characteristics, can you guess which animal they make? This might seem easy enough. But solving the puzzles in this book is deviously, outrageously, almost impossibly tricky! Though the thirteen animals included are easily recognizable --- such as polar bear, snail, ostrich, pufferfish --- the clues are unexpected. For example: ?3 billiard balls,? ?dinosaur feet? and ?five feather dusters.? And to further complicate matters, the clues are presented in scenarios unrelated to the animals --- the ostrich is composed of items in a ?gentlemen's den? and the pufferfish clues are items in a spy submarine. Once readers make a guess (or if they get stumped! ), they can open the gatefold to reveal the animal, with each clue explained and lots of additional fascinating facts. To ask other readers questions about Beastly Puzzles, please sign up. I won this book in one of the Giveaways on Goodreads, intending to give it to my newphews. I read it before giving it to them. How clever! The clues were tricky and fun to figure out what the animals were. Maybe 7 is too young for the puzzles. But a fun read with great illustrations. I can't wait to give this to them! This book is a superb combination of puzzle solving, picture searching and animal science. Pages of softly muted colored illustrations fold open to reveal answers and facts. This unique non-fiction compilation will appeal to creature lovers aged seven to 10. Very interesting way to intrigue your kids need of puzzles. Informative, Creative and Beautiful. Definitely Brain-Boggling. The book had a really cool format. I intended it for my goddaughter; I think she will like it since it even stumped me on some of the puzzles! I received this book for free through Goodreads Giveaways on Thursday, April 4, 2019.